Titan Poker is one of the oldest and best established names in online poker and they are a brand that has stood the test of time. They’re well known for treating their players better than almost any other poker room out there and have won Gambling Online Magazine’s Gold Award for providing the Best Online Poker Customer Service in the years 2006, 2007, 2008, 2010, and 2011. They operate on the Playtech software platform and are a member of the iPoker network and as such they are part of the 3rd largest online poker player pool in the world. 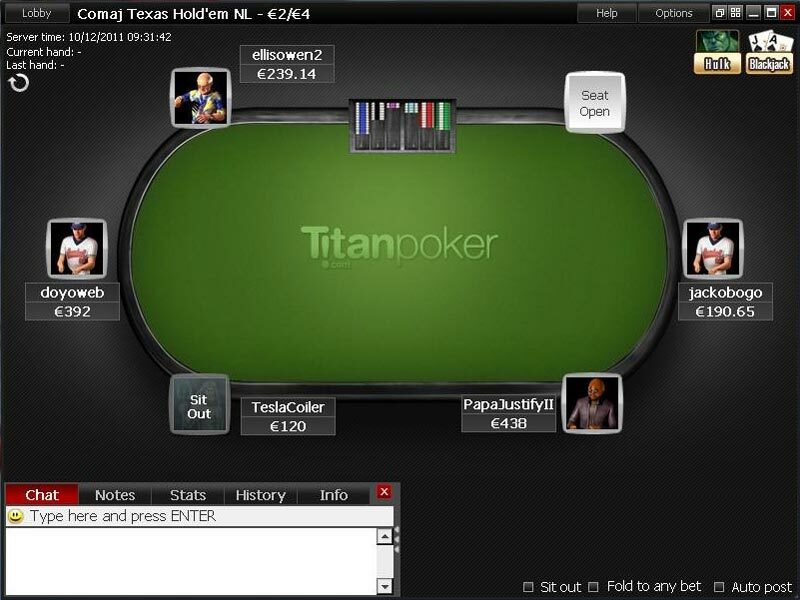 Titan have been on the scene since 2004 and provide a poker home for players from all over the world. They are licensed in Antigua and Barbuda and their software is regularly audited by Technical Systems Testing for fairness and a true random deal. They are a big part of the poker community and if you play live poker tournament, you’ll always see people wearing Titan Poker badges and their blogging team keeping an eye on things. As mentioned Titan Poker are a member of the iPoker network, meaning that they share players with other members of the network and use the software platform developed by Playtech, who are a well known company in casino and poker software development. The have been criticised in the past for the lack of updates to their software and indeed it went largely untouched from 2005 to 2010, but since then they have begun to update it on a more regular basis. The animations and overall feel of the software are still a little bit basic and lag behind some of the competition but they have introduced lots of the features that their players had been asking for like re-sizable tables, auto-top up for cash games, and late registration for tournaments. There aren’t too many customisation options however, and one thing that is still missing is synchronised breaks for tournament players. The lobby can be customised with filters to show only the games that interest you, but the filters are a little confusing at first. You can play up to 16 tables simultaneously at Titan Poker and tables can be tiled or cascaded to suit the screen you’re playing on. One of the reasons that Titan Poker remains so competitive in an online poker market that’s swamped with competition is the bonuses and promotions that offer great value to players who choose to play there. At the moment they’re offering new players a 200% deposit bonus up to $2,000 which is a bigger bonus than almost any other site offers. To earn the bonus, you have to play real money poker at the site and as you do, increments of the bonus will be released. For each 250 Player Points you earn, $5 will be credited to your account. Player Points are accrued at the rate of 15 per dollar paid in cash game rake or 17 per dollar in tournament entry fees. When you’re an established Titan player you can go on to earn $1 in cash for every 100 Points that you earn and you’ll also be enrolled in the Titan VIP club and you can use the Points that you accumulate during play to buy VIP bonuses of up $14,000 from the VIP store. Titan Poker have relationships with almost every major internet payment processor in the world and as such the number of deposit and withdrawal methods at your disposal means you should find it easy to get money onto the site. Aside from the usual credit card and debit card transactions, they support eWallets like Neteller and Skrill as well as prepaid cards like PaySafeCard and Ukash as well as local banking services like Multibanco, eKonto, and Laser. Titan Poker is best known for its No Limit Holdem cash games and tournaments. The cash games there have been tough for a while thanks to many sites on the iPoker network offering under the table VIP deals to attract high volume professional players. The games are due to get a lot easier though, as iPoker is in the process of separating the network into 2 tiers, and Titan Poker players are going to have access to the player pool of sites that play by iPoker’s rules and have a player base that consists mostly of recreational players. The tournaments at Titan will continue to be very soft after the split. They have always had very soft fields and the big daily guaranteed prize pool tournament typically attract fields in the hundreds, meaning you won’t have to be playing all night if you want to win one. The highlight of the tournament calendar is the $200,000 guaranteed Sunday Blast which starts at 7 pm CET on Sundays and has a $109 buy-in. Aside from Holdem, the Pot Limit Omaha tables at Titan get lots of traffic and you’ll not struggle to find a game at stakes up to $2/$4 and $5/$10 running around the clock. They also have one of the biggest player pools for Omaha hi/lo. Stud games are also offered but only run sporadically. If you want to play at a big site where you know that your money will be secure and the games will be fair, then there are few better choices than Titan Poker. They excel at looking after their customers and the games there on the whole are very soft. The $2,000 signup bonus that they offer clears fast than any comparable bonus at other sites and their ongoing VIP represents good value for their loyal players. 200% up to $2000 Bonus. Progressive jackpot Sit & Gos. Good software with late regristration in MTT’s. Features soft games on iPoker Network. 36% cashback through VIP Rewards.